"By way of a genetic agent, Vincent becomes Jerome. IDs are changed, urine tests faked, Vincent even has to undergo surgery on his legs to make him shorter." Actually if I am not wrong Vincent undergoes surgery on his legs to make him taller; Vincent is an "In-Valid" his genetic makeup as a result of his natural birth is "inferior" where as Jerome is a genetically engineered "Valid" and due to his "superior" genes has better mental and physical abilities including greater height. So, Vincent obviously undergoes surgery to make him taller - as tall as Jerome; however he can't get surgery done for his Myopia because operation scars would show up during a retina scan. Its been quite a while since I saw this movie but I am sure that's how it is. In case not then you have my apologies. Great memory JP. And thanks for bookmarking the site. 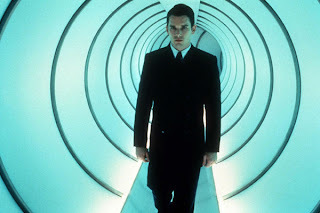 Gattaca is great underappreciated flick.